Jenn Grega outside The Fish Tank Haddon Township. Credit: Matt Skoufalos. Haddonfield entrepreneur Jenn Grega says she’s excited to take advantage of the transit-oriented development to connect with teleworkers and independent businesspeople for her new venture. Exterior, The Fish Tank at the Haddon Towne Center in Haddon Township. Credit: Matt Skoufalos. Since the Haddon Towne Center brownfield redevelopment was completed, the project has found much more success as a residential rental property than a commercial one. Although its 252 residential apartments are nearly fully rented, the 12,000 square-feet of ground-level retail space at the base of its 1000 and 2000 buildings have mostly lain dormant since the Center’s 2017 ribbon-cutting. 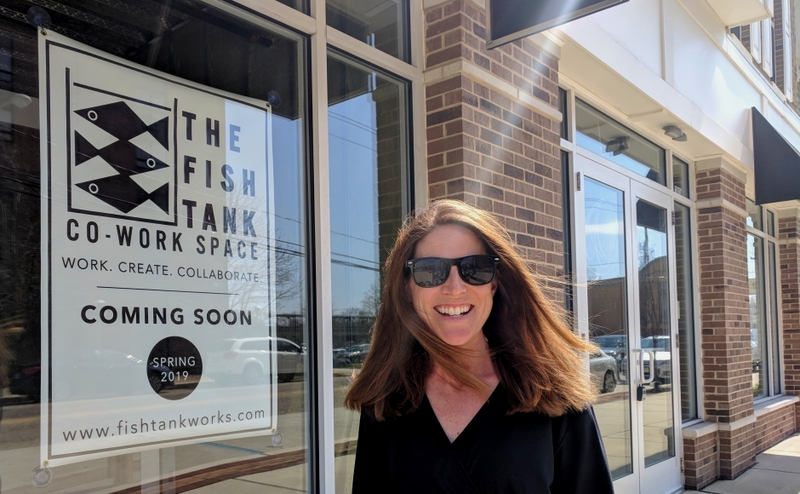 Next month, however, it could welcome a variety of business uses, as Haddonfield entrepreneur Jenn Grega opens the doors of The Fish Tank coworking space. Grega had been hawking the Towne Center since she noticed the for-rent sign walking by last April. Even as a blank canvas, the 3,000-square-foot space was perfectly suited to her needs. In addition to offering ample parking, the Center is accessible on foot, by bicycle, and lies within 60 seconds of the PATCO Speedline public transit system. The first-floor storefront eliminated any questions of accessibility, and its sizable footprint offered a generous floor plan for her business. Jenn Grega surveys the fit-out at her coworking space, The Fish Tank. Credit: Matt Skoufalos. As a consultant with Bicycle Transit Systems, the parent company of Philadelphia bike share service Indego, access to different modes of transportation is a priority for Grega. She wanted to build her co-working space around the same values (so much so that she’s offering discounts to her cyclist and pedestrian members). Grega’s own commute to Philadelphia often consisted of a walk to the Speedline to get into Philadelphia, where she’d ride a shared bike to work in South Kensington. “I am a strong believer that transportation builds communities, and it’s such a huge thing to have a train [nearby],” Grega said. Grega hopes to welcome her first members to the Fish Tank by May 1. Anyone is welcome to join, but she believes most will be consultants, like her; remote workers in established careers who are looking for a unique office environment. She’s found support from fellow entrepreneurs like Rosemari Hicks, who operates CoWork Street in Camden, Tom Marchetty of The Factory in Collingswood, and her fellow business owners in the Haddon Township Business Improvement District (BID). Fish Tank floor plan. Credit: Jenn Grega. Even the concept for its name—The Fish Tank—came from Grega’s time at the glass-walled WeWork coworking offices in Philadelphia, which she regarded as a cross between a fishbowl and a think-tank. 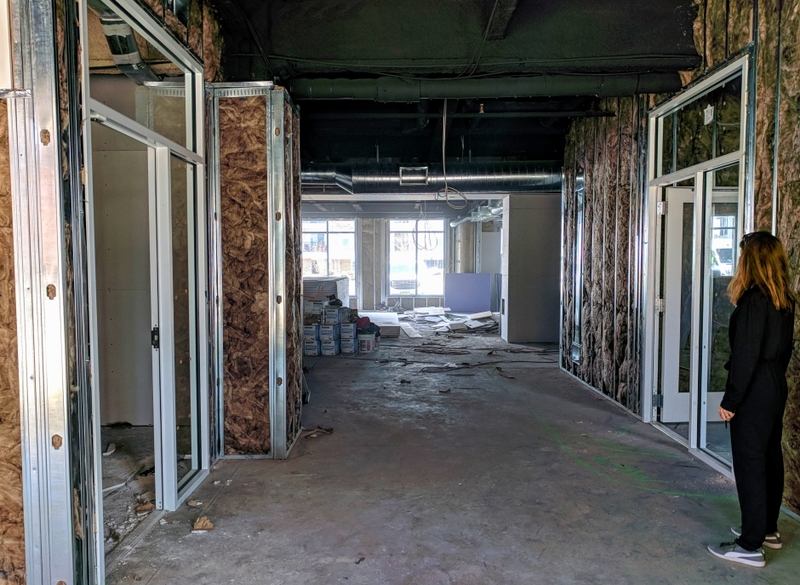 The Fish Tank will share some of those sightlines, offering a clear view from the Haddon Avenue sidewalk straight through the 1,200 square-foot, open-concept work area, and into the parking lot beyond. That bullpen will house 20 desks offset by three private offices, a 14-person conference room, and a lounge. 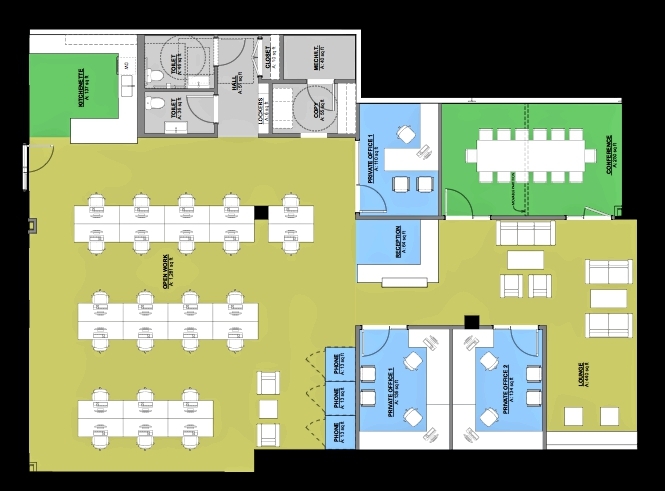 There’ll also be a kitchenette stocked with Revolution Coffee, phone booths for private calls, shared office equipment, and storage lockers. Like most coworking spaces, The Fish Tank also will offer flexible access, with hourly rates starting at $6 for an open-area desk and $10 for an office seat. Full-day rates start at $40 per day for an open desk, and $70 for an office desk. Partial and monthly rates are also available. Grega said she’s shooting for a 50-percent occupancy rate within the first half year, and hopes to attract as many as 150 members on at least a part-time basis. She also wants to make The Fish Tank available for use by local nonprofits as well as for private events. 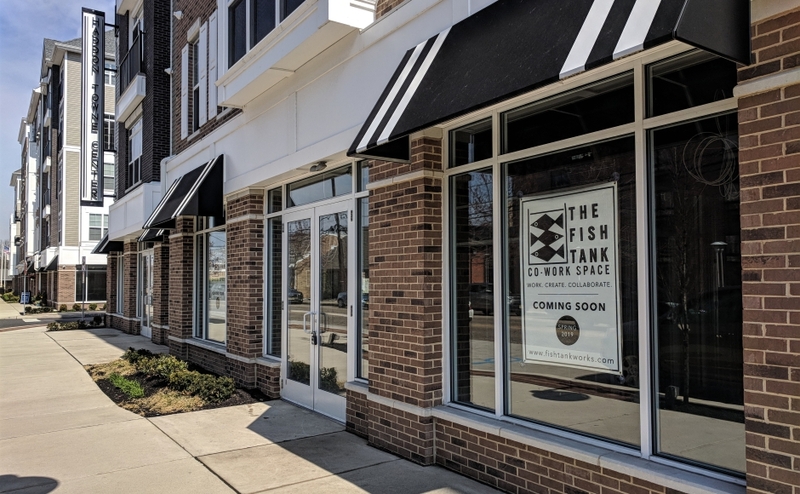 The Fish Tank is located in the Haddon Towne Center on Haddon Avenue in Haddon Township. For details, visit the business webpage.